Since most modern structures are built on a concrete slab, the stage is already set for a durable, abrasive-resistant, and potentially stunning final surface, without the need for expensive installation costs and additional materials. CEI Surface PROS is a leading provider of decorative concrete and other services throughout the Naples, FL area. Our experienced technicians will prepare your existing concrete surface with diamond-encrusted pads and a chemical densifier, then stain, stamp, or dye and refinish according to your specifications. When texture and color are added to give the appearance of stone, brick, slate, and sometimes even wood, it is considered stamped concrete. The array of possibilities combined with great durability and a cost that is typically lower than the materials it imitates make stamped concrete an easy choice for new construction and renovation projects alike. Stamped concrete is a desirable finish for driveways, patios, commercial roads and parking lots, and even interior floors. However, over time, dyes may fade and the surface can start to look patchy and unpresentable. CEI Surface PROS can rejuvenate faded or damaged stamped concrete and get it looking like new again. 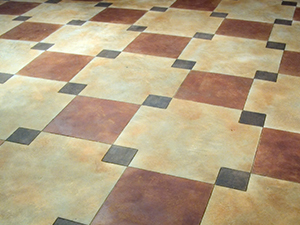 There are a variety of stains and dyes that can be applied, re-applied or incorporated into concrete surfaces to enhance or restore the appearance or your flooring. Color is achieved by using dry shakes or color hardeners, powder or liquid releases, integral colors or acid stains. All these products may be combined to create even more intricate designs. Top it off with polishing and the results can be both durable and strikingly beautiful, and a wide range of looks can be achieved. We can give your concrete the look you want. Contact us online or call (239) 455-1167 for a FREE estimate on decorative concrete services throughout South Florida – Port Charlotte, Ft. Myers, and Naples. We will travel up as far as Sarasota.